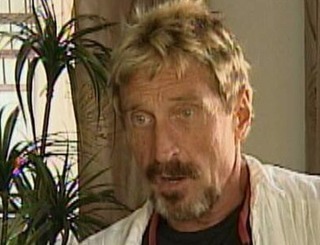 John McAfee, who started the antivirus software giant named after him, has been accused of murder in Belize and wanted. Gizmodo reports that McAfee has been living in Belize for a while now, spending most of his time there experimenting with drugs. McAfee's marketing slogan: "Safe is not a privilege. It is a right." This news comes just a few days after Gizmodo ran a long story about McAfee's increasingly erratic and borderline criminal behavior. In it, he sounds paranoid as he talks about people wanting to take his money and kill him and he admits to having associated with gangsters in Belize. McAfee had taken to "posting on a drug-focused Russian message board...about his attempts to purify the psychoactive compounds colloquially known as 'bath salts,'" Gizmodo wrote. The scariest aspect of this story may be the fact that an entire lab was constructed for John McAfee’s research purposes. Because of his efforts to extract chemicals from natural chemical plans McAfee was able to justify his experiments in a country that is largely unregulated. McAfee’s strange behavior is nothing new, according to people who knew him, McAfee would often make constant advances towards women, often coercing them into bed.